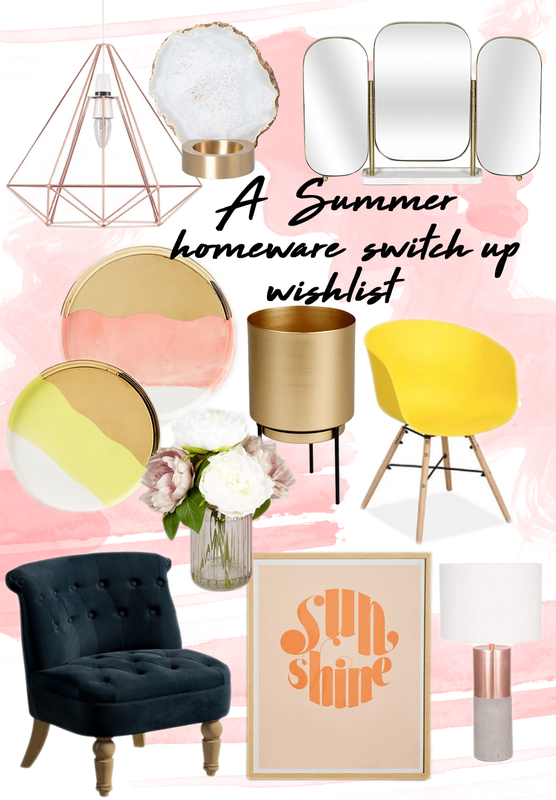 With Summer in full swing, and my move back home permanently after 3 years of student living, a homeware switch-up has been on my mind. There’s something about new seasons which makes me want a good old re-fresh and re-vamp, so to get my inspiration juices flowing I put together a little homeware wishlist. As always, the copper theme is still going strong, with this super cute pendant light and table lamp to match. As much as I still love the copper, I’ve found myself gravitating towards gold accents a lot more recently. I think it’s so classic and clean. I am so in love with this dressing table mirror it’s gone to the top of my wishlist. Currently, on my desk, I just have a white wall-mirror propped up, so this one would be the dream! Another thing I’ve been keen to integrate into my homeware recently are some plants. I love the idea of some fresh greenery in my room, especially while the suns shining! I can see a cactus or a hanging plant looking v. v. cute in this planter from Matalan. As much as I love some growing and alive plants, I can’t resist some faux flowers. I adored my peonies I got from Aldi last month so these ones would be perfect for my room, and make a lot less mess! I have a Scandinavian style seat at my desk from eBay that I got years ago, but I can’t resist this yellow moulded chair. We all know how much I love the colour yellow by now! I certainly don’t have room for any other chairs in my room but if I did I’d definitely for something like this fabric chair. It’s such a statement and this dark blue colour is something I wouldn’t usually go for but I’m so drawn to it! My gallery wall is one of my favourite parts of my bedroom, and this sunshine print would be the perfect addition – so cute right?! What’s your favourite piece from my wishlist? Do you have a homeware switch up in the new seasons?